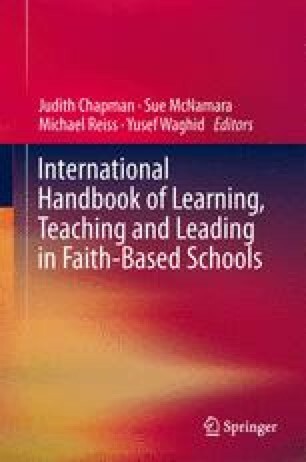 In this chapter I set out to identify and explore how the values and ethos of a faith-based Muslim school affect practices in learning, teaching and leadership. After teaching at a faith-based school for over two decades, sharing my experiences and thoughts about the distinctive philosophies and challenges become important background knowledge in the contemporary era. I share my reflections on how this faith-based school contributes to the democratisation of society and contributes to nation building. This chapter provides a perspective from an educational leadership position using self-reflexivity and documentary evidence as research methodology. My conclusion supports the notion that a faith-based educational institution can contribute positively towards the realisation of a greater good to all and promotes a cohesiveness that is much needed in an ideal democratic society.